From Antigua, the abolitionist trio* headed to Jamaica to speak at a Public Forum at Campion College High School, Kingston Sunday afternoon. The audience of about 60 persons comprised mainly lawyers and students. Archbishop Dufour and Jamaican Attorney-at-Law and former Judge at the Inter-American Court of Human Rights, Margarette May Macaulay were also present. Again, she urged governments to adopt more appropriate/durable strategies to prevent crime. She pointed to examples such as Suriname: a country in the region that is in the process of removing the death penalty from its criminal code. The audience was touched by the powerful testimonies of Juan and Renny. Among emotional moments, was when Renny Cushing recounted how one day in court, someone pointed out to him the son of his father’s killer. Later the offender’s son and Renny found themselves alone and talked. The man started to apologise to Renny about his father’s act. Renny stopped him saying that he did not have to do so, as he had not committed the crime. Juan’s story was also a basis to highlight the myriad of injustices that form part of death penalty systems: the high risk of it being imposed on innocent persons, as well as its unfair and unequal application on the basis of race and class. Strong points were made underlining these inequalities. Leela Ramdeen reminded the gathering of the saying: “Capital punishment is for those with no capital”. On Monday 6 October, the abolitionist trio had a busy programme too. They appeared in the popular morning TV programme, Smile Jamaica, on TVJ; and on the morning radio show of Lloyd D’Aguilar. They then addressed Law Students at the Norman Manley law school. From the lively question and answer session, it is clear that the students generally have questions about the humanity of the death penalty and of its deterrence to crime. The Trio also met with Catholic Archbishop Charles Dufour who committed to take further action to address issues relating to the death penalty. 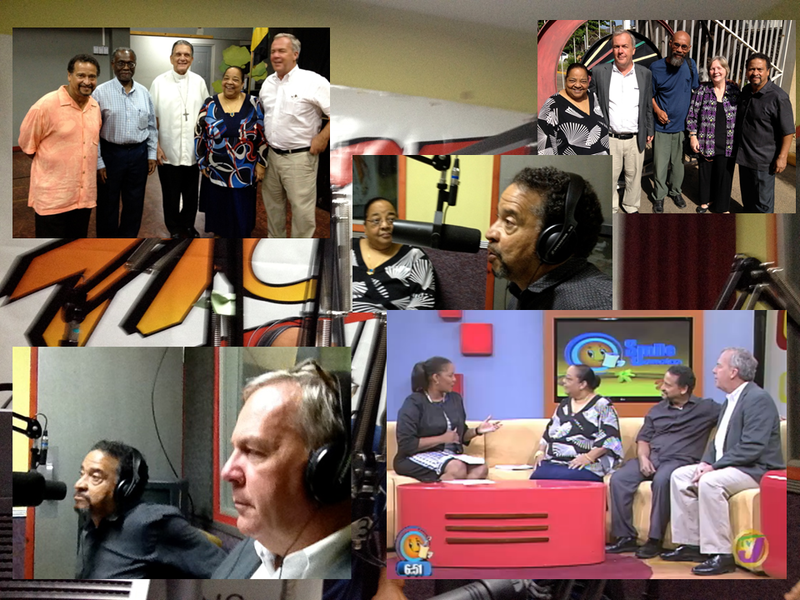 Later in the afternoon, Juan Melendez and Renny Cushing had another radio interview with Dionne Jackson Miller. This extensive Jamaican programme was put together thanks to the efforts of Dr. Lloyd Barnett, a member of GCL’s Executive, and IJCHR member, together with the team of the Independent Jamaican Council for Human Rights, and in collaboration with the Archdiocese.